Certain objects are considered masterpieces not just for their beauty or sophistication, but because they evoke a profound emotion, because they are precious, because they represent a splendid example of innovation, savoir-faire or a philosophy of precision. In its quest to create the most indulgent skincare more than 30 years ago, La Prairie unveiled to the world caviar’s unique power to nourish and regenerate the skin, creating a masterpiece of design, science and indulgence. Today, La Prairie remasters its masterpiece, inspired by the idea that a masterpiece is at once from a different time and forever contemporary. A masterpiece lives beyond the limits of time. Its effect is eternal. It has a distinctive style, an exacting technique, a clear balance and a refined harmony. 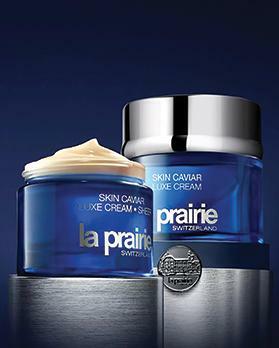 After years of research that leverages its unparalleled caviar expertise, La Prairie reinvents caviar with a new incarnation: Skin Caviar Luxe Cream Remastered with Caviar Premier, a moisturising cream that offers a unique dimension of sensorial indulgence paired with never-before-seen lifting and firming. Remastered with this new form of caviar, Skin Caviar Luxe Cream provides unmatched visible results. Combined with La Prairie’s Exclusive Cellular Complex, which uses cutting-edge biotechnological research to give new life and energy back to the very cells where beauty is born, it offers a phenomenal formula for legendary lifting and firming. Caviar’s benefits are strengthened and magnified. The skin undergoes a total transformation. Features are supported, tightened and toned. Skin gains in tautness and suppleness. From the moment the iconic cobalt blue jar is unveiled from its silver box, its status as a masterpiece becomes clear. Geometric lines inspired by the Bauhaus movement, coupled with clean, minimalist Helvetica typography make the Skin Caviar Luxe Cream jar a study in elegance. The richly-coloured glass vessel topped with a polished silver cap evoke precision and purity. The design became an immediate classic when it was launched and has been preserved as an homage to the heritage of the Skin Caviar Collection. Experience legendary lifting and firming in two indulgent textures – for the luxury of choice. Both Skin Caviar Luxe Cream and Skin Caviar Luxe Cream Sheer have been remastered with Caviar Premier.